Seasonal cooking is all about enjoying ultimate freshness and higher nutrition, and during the fall season, the pumpkin is a perfect pick for healthy in-season eating. 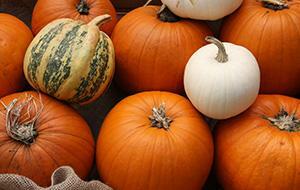 Pumpkins are chock-full of beta carotene, a plant carotenoid which is converted to vitamin A in the body. And foods high in beta carotene may offer protection against some degenerative aspects of aging, may offer protection against heart disease, and may reduce the risk of developing certain types of cancer. For a tasty, delicious fall breakfast, make a stack of these pumpkin pancakes using fresh pumpkin puree.